Another shot from my earlier, and even less competent days of photography! I've a couple of hundred shots taken with this old camera which I didn't really know how to use. I now hope the subject matter partly justifies the poor quality. This is a pic. taken in Plymouth during the summer of 1976 whilst on holiday in Cornwall with a school friend's family. It depicts two of the Municipal fleet's large and well kept fleet of Leyland Atlanteans. FJY 914E, an MCW bodied example undergoing a crew change is about to be overtaken by an older more traditionally styled MCW bodied open-top.. itself pursued by one of their short lived Nationals. 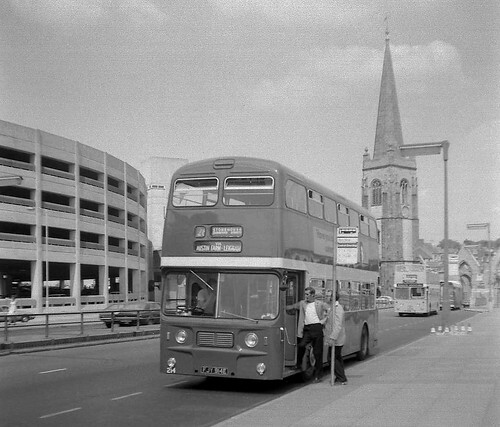 The photo was I think taken above Bretonside bus station which is on a lower level to our right.